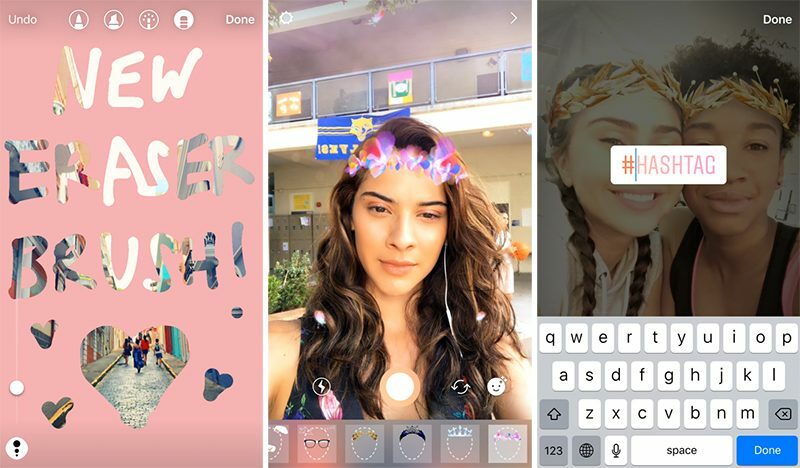 Instagram today introduced even more Snapchat-like features in the latest version of its app, including face filters, a customizable hashtag sticker, a "rewind" playback option for videos, and an eraser brush. Just like Snapchat, the face filters allow users to add bunny ears, glasses, tiaras, and other virtual objects to their selfies. There are eight filters to choose from after tapping the new face icon in the bottom right corner of the camera. The new customizable hashtag sticker can be added to photos by tapping the sticker icon at the top right of the screen. People watching an Instagram story can tap the sticker to visit the hashtag's archive and explore related posts. The new "Rewind" option simply enables users to make their videos play in reverse, while the eraser brush can remove parts of overlaid drawings or color. The new features are available in the latest version of Instagram for iOS rolling out today on the App Store [Direct Link]. What a bloated mess, just like all the other "Facebook family of products". I still haven't gotten over the fact that Snapchat, a messenger, let's not kid ourselves, that gained most of its appeal from "safely" sending nudes to acquaintances is now one of the marketed ways to engage with brands, many of which are old-fashioned and traditionally slow to adopt technological change. In their Quest to copy Snapchat, Instagram let their Guard Down, and has been Leapfrogged by one third-party app implementing the Next Big Thing, "Social Motion Photography" ... true Innovation doesn't come from copying (& refining) someone else's features, it comes from Blazing One's Own Path, and taking chances ... soon, everyone will see a new app icon next to Snapchat, Instagram, Facebook, Twitter and YouTube. what in the world are you going on about? Imitation is the sincerest form of wanting to crush the competition. Right there with you. It's why I've resisted Snapchat for so long -- the stigma from their early days is hard to shake. Even though I know a lot of teens who see it as basically another messaging app. Makes me feel old. I mean Really, what the Hell, is he even Trying to Say? Thank God I am running a custom version of Instagram with Instagram ++ baked in so my app never shows as having updates in the app store. They keep adding these crappy features.